Zip up in this season's colours! 21 colour(s) to choose from! 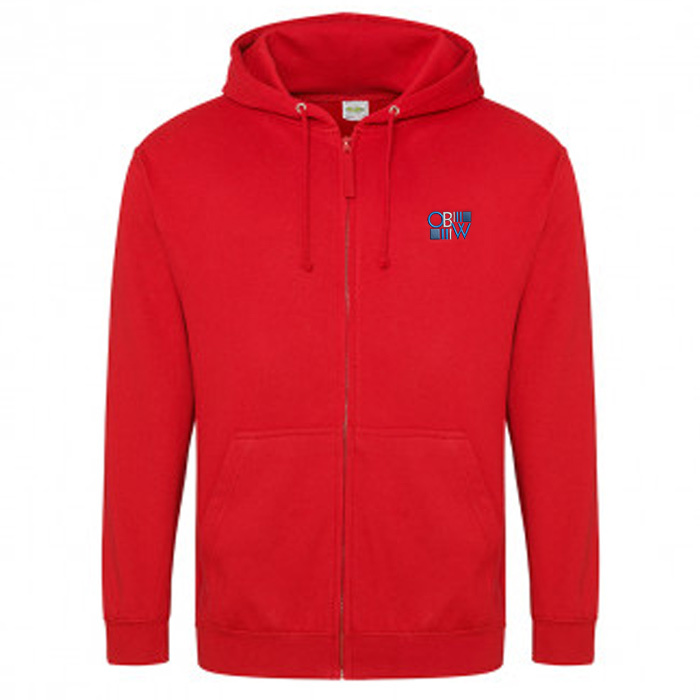 280gsm hooded sweatshirt with a zip front for easy wear, available in a great range of bold colour options. With a two front pouch pockets, the right pocket features a handy hidden opening for ear phone cords on the right hand side - there are also hidden ear phone loops in the hood, so they can listen to their music with the wires safely tucked away! Also features a self-fabric covered main zip, twin-needle stitching detail, double fabric hood with self-coloured draw cords, and ribbed hem & cuffs. Chest sizes: S (36"); M (40"); L (44"); XL (48"); XXL (52"); 3XL (56"); 4XL (60"). No complicated stitch counts - our price includes your logo sized to fit within either 50 x 50mm square or 70 x 25mm rectangle in up to 7 thread colours; for embroidery larger than these sizes please call for pricing. Price includes embroidery to 1 position. Embroidery area: 50 x 50mm or 70 x 25mm. Ready to ship in : 15 business days *.